Olivia talks about going on Band/Orchestra tour during spring break! Demetrius Rowser takes over the vlog to showcase his spring break experience on PLIA 2019. Olivia talks winter and recommends some gear! 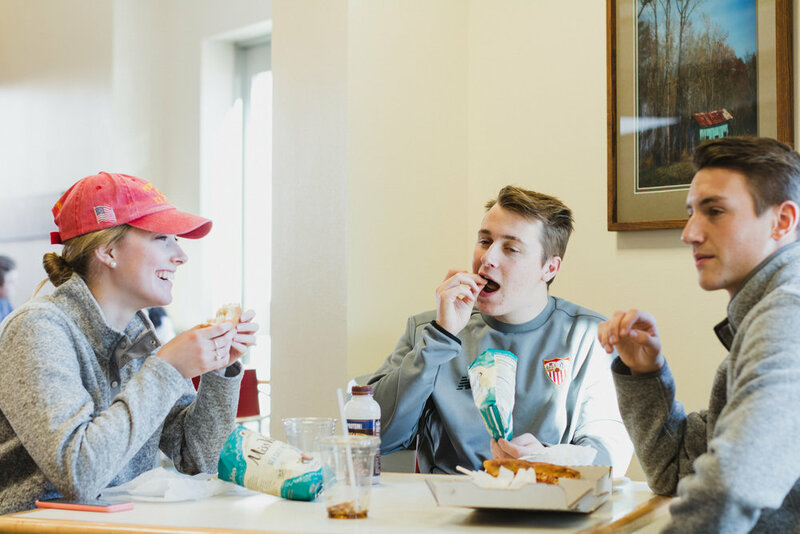 Students enjoy hot food at the Grille, a dining option at Dordt located in the Campus Center. Do you want to know what really swayed my college decision? Granted, I cared about the professors and financial aid and the dorms, but when it came down to it, eating in the Commons on my visit day sealed my decision. Now that I’ve been at Dordt for a couple of years, I’ve picked up a few tricks for navigating dining at Dordt—so hopefully they’ll help you out too! BE PREPARED. As a freshman living on campus, I made sure to know when the Commons, our dining hall, and the Grille were open. If I knew I couldn’t make it to lunch at the Commons, I’d run to the Grille at 11 and pick up a Grab ‘n Go meal to eat instead. Now, as a commuter with plenty of classes around the noon hour, I make sure to pack a sack lunch each morning. EAT BREAKFAST. Whether that’s poptarts on the way to class or sitting down for an omelet at the Commons, breakfast is important. I’m usually more awake (and less crabby) when I’ve got some food in my stomach during an 8 am class. PAY ATTENTION TO SPECIAL MEALS. The Commons put on several special meals each semester—like Canadian & American Thanksgiving meals, carnival food at Hoops Happening, and sometimes they even do a Star-Wars themed meal in May. Pay attention to announcements via posters and email to find out when special meals are—they’re often the most highly-attended, so get there early! WATCH THE SIGNS. If you have a food allergy or intolerance, I highly recommend talking to our Dordt Dining staff—they’re great about preparing gluten-free food separately and being considerate of your eating needs. Plus, they put up signs with icons that tell you if a dish has dairy, wheat, seafood, etc—as a lactose-intolerant person, it’s been super helpful to know which dishes I should avoid. LEARN THE STATION ROTATION. Wing Wednesday, Mac ‘n Cheese Monday, Phillie Friday—these are just a few of the reoccurring stations that the Commons will have every week. Sick of eating pasta and burgers? Try out the food station and you might be surprised by a chili bar, hot wings, or burritos. MAKE MEALS WITH FRIENDS. Even though underclassmen don’t live in the apartments, there are kitchens you can access in each of the residence halls. Walking through West, I’ve been invited to a Saturday-morning pancake bash, seen students making dumplings, and used the microwaves to heat up leftovers, all in the building’s second-floor kitchen. So if you’re in the mood for some homemade food just grab some friends, fire up the stove, and get cooking. Otherwise, enjoy yourself! There’s tons of healthy food options—some of my favorites are the Common’s rice blends and salad bar—and not-so-healthy options too, like pizza and cheese curds at the Grille. One of the best things about the Commons is that they always have something new or different to try alongside student classics. And honestly, the best tip I can give is to just plan ahead. Be aware of when you can get hot sandwiches from the Grille on meal exchange (the Defender is my personal recommendation), learn where the microwaves are, and don’t skip out on Wing Wednesday. Seriously. Those wings are the highlight of my week. Meet Jade Goebel, a music therapy major from Granville, Iowa. My grandparents told me about it--that's how I first heard about it. I came on a visit, because they were like, "Jade, you need to see it here." I loved the visit and all the people. The staff were very nice about dealing with all my questions. Eric Tudor was my admissions counselor and I asked him so many questions. He was so nice about it. Yeah, how they said that they would include the Bible in every class. I never really realized that until I was here. That stuck out. Otherwise, the staff was awesome. All of the professors have been very nice. The worship services have been outstanding. I like Monday night worship, that's my favorite, because it's so intimate and you move how the spirit leads you. Everyone's very flexible with my schedule--I have wiggle room. They've kept me very active in asking me questions and making sure I understand the material. We do a lot of hands-on stuff, even though psychology is not typically a hands-on class. I never thought that we'd be doing hands-on stuff, but we do a lot of activities. Today, we did a memory activity that was really fun. It's great because that's how I learn, and they've done a good job of teaching me how to do hands-on stuff. What would you say to someone back in Granville who's looking at Dordt? Oh, this is good. I would say go on a visit for sure. I think hearing about Dordt is great, but going on a visit is so much more--you get more information from it. If you want your spiritual life and your mental capacity to grow, go here. That's what I've seen. Is there anything else that you want to say about Dordt or think people should know about Dordt? It's just a very welcoming community, especially if you come from a small town, and even if you don't. It's a nice area, nice community, awesome people, good education. I like that it's small. That could just be me, but I like that it's a small school and very Christ-centered. Meet Luke Bousema, a freshman Biology major from Escondido, California. It came down to a lot of things. The academics, I had heard, were pretty good, and the community was good too. I thought it was important to surround myself with people who are a good example. I had some siblings who went here too, and some family out here, so that made the transition a little easier. How was your Dordt visit? I visited during spring 2017. I stayed with Trevor De Jong, and it was a good time. I liked seeing the sports facilities. I played a lot of racquetball while I was visiting, and that was fun. I went to the game room, where the bowling alley is--it's pretty cool down there. The science building was nice, the labs were cool to see. I'm enjoying starting to get to know a lot more people. The facilities are nice, the labs are exceptional for all the science things we do. It's nice to have a new science building. The food is pretty good--the burgers are good at lunch. (Laughter.) I like that. My science teachers--Dr. Visscher, associate professor of chemistry and planetary sciences, he's super smart. All the biology professors care about you and like to help you out, prepare you for tests, which is nice. The labs are a lot more open-ended than high school labs. It comes down to what you want to do with it, so it opens it up to creativity. I feel like in future years, when I know more about biology, I'll be able to use the labs to test things. You can always ask someone to open the labs for you, so you can always go in there and do some experiments. My adviser was really helpful. I dropped out of a class, and he was able to work through those schedule changes and he was willing to argue my cause to the other departments. It was nice to have somebody who understood what I wanted, and eventually it happened. I made the switch, and now everything's a lot better. I dropped out of the class because it wasn't right for me, and then I picked up another class that was also required, so I'm glad that happened. Professors here are really nice. The biology department hosted a dinner and I got to talk to a lot of the professors there. It was nice to see them caring about us out of class, and not just in class. I was surprised by all the events that happened, and how late things are at night. It was funny--an event started at 10 PM and I thought that was kind of crazy, but it was also fun, being up that late at night with a school event. The block party was a good time. Also the labs--how nice they are, and how willing they are to use them--that surprised me, how open all the professors are to having a bunch of freshmen use their equipment. Here, they're like "this is for you, go ahead and use it." What would you say to someone back in Escondido who's looking at Dordt? I would tell them that the academics here are strong, and the community and friendships that you make are important for the rest of your life. Most people here are willing to talk. It's funny, the other day I was walking and I sneezed. Somebody in the third floor of East Hall just says "bless you" from far away, and I was like--the only place that would ever happen is at Dordt. Meet Christianna Marcy, an elementary education: general classroom major, Kuyper Scholars minor, and special education minor from Holdredge, Nebraska. I came to Dordt through a long process of God pounding at my heart trying to get me here. I first heard about Dordt through a mentor the summer before my senior year. At the time, I was overwhelmed with the choices of colleges. I could go anywhere, I could major in anything, I could be whoever I wanted to be--and that was very scary. It was a huge decision to make. I started going on college visits. When I got to Dordt, I could feel the peaceful atmosphere. I really liked that, but I wasn't sure if that was what I was looking for. I went on more visits, and I kept comparing them to Dordt. In the spring of my senior year, I had it down to two colleges. It came down to which one fit my personality better, and that's why I chose Dordt. When I was looking at the cost, that was a big factor, because I'm paying my way through college. I realized that it was partly the investment of money, but I was also investing four years of my life into it. I looked at the worldview I would come out with as a teacher, and who I wanted to be as a teacher. When I realized that hopefully I would go into missions or something similar, it was really important that I would be investing my mind, my outlook, and my time into a Christian college that supported all of the values that I did--and would be encouraging and teaching me as a very qualified teacher to go out and changes the lives of students. Is there anything that stuck out to you when you visited? Dordt was the only college where I could ask my questions and get honest answers back. I would ask very down-to-earth questions. I actually went and met with the president's wife, Dr. Barb Hoekstra, professor of education, not knowing she was the president's wife. I asked her those hard questions and she gave me very real, honest answers. But more than that, she cared about where I ended up. She cared about me as a fellow servant of Christ. When I realized that she was the president's wife, I thought "Wow! If he married her, then he must be pretty great too." (Laughter.) That was one of the things that really drew me to Dordt. They didn't try to shy away from the truth, and if they didn't know the answer, they'd find someone who did. Is it wrong to say everything? (Laughter.) Seriously, every part of my day has surprised me at how amazing it's been. I wake up and I get to see my roommates. There's four of us in a small room, but we're all very encouraging to each other. I can go to the commons and see ten different people that all say good morning to me and ask me how I am. I go to class, and the professors pray before they start. They reach really deeply into the knowledge they want us to know--it's not just shallow stuff they're giving us. I go to work in the costume shop for the theatre, and it's a blessing to be able to do something I love. After that, I might go to clubs. The amount of involvement you can have here is amazing. From morning till night, every day is beautiful. Not easy, though. I want to make that clear--I thought transitioning would be easy, and I think that's false. For any freshman out there who's also feeling like, this is a little harder than I thought, it's okay. Sometimes the lonely moments can be hard, but I love this place so much that I wouldn't trade it for any other experience. You mentioned some of your classes--how do you feel that your professors have engaged you so far? That's a good question. I'm trying to think through all my professors and say one thing that fits all of them--they're kind of different. I can remember my Ed 101 professor saying “Within a couple weeks, I want to know each of you by name.” He would try so hard--he'd look at you and try to know your name, and within a couple weeks, he knew all our names. It meant a lot to me that he would try so hard to know us. I have Dr. Wayne Kobes, professor emeritus of theology, for my Core 100 class. He's like the sweetest grandfather. It feels like every class is a devotional about your purpose in life. That's really cool. I have Dr. Bruce Vermeer, professor of psychology, for my psychology class, and he brings back how the development of a child is rooted in our miraculous God. And yet, we're learning the same concepts you might learn at any other college, but it's so much deeper than just concepts. I've got a lot of great professors--it's hard to say one thing for all of them, but that's the beauty of them. They're so different that they engage you differently. Hm. I came in here worrying that I wouldn't fit in. Because I was blessed with amazing roommates and an amazing hall, the relationships I built happened pretty quickly. How genuine they were surprised me--that I could feel loved so quickly. I went home over Heartland Break, and it was hard to come back because I love home, but when I got back, I was surrounded by hugs and well-wishes and it was an amazing feeling. It surprised me how many people God allowed me to meet to help me feel at home here. What would you say to a high school student from your hometown who's looking at Dordt? I came from a public school, so I would say that the value of this education is so much more than the price tag that you see. You are investing so much more than just money. Education is so much richer and more beautiful when God is in it. That was a huge surprise, because I didn't think it would be that much different. But when you see it, it's like such a breath of fresh air. I'd say it's worth it a hundred times over. Is there anything else that someone should know about Dordt from your perspective? It's a lot of fun, and they should join the swing dance club. (Laughter.) I've gone to a fiesta so far, I went to the retreat where I got second place in a contest. I do theatre, which has been a blast. I'm doing the mics, and helped with hair and makeup and costuming for My Fair Lady. If you want to get involved, you can be so involved. Probably every freshman has struggled with time management--that's where I'm at, finding the balance. It's all so much fun. Olivia goes to the logo reveal party, check out the new look for Dordt University! Meet Cole Boonstra, a Pro-Tech: Manufacturing Technology major from North Haledon, New Jersey. From my understanding, this is the only Christian college with a manufacturing program. In New Jersey, there are technical schools and whatnot, but you go there for a time and only walk out with a piece of paper that says you know how to do something. Here, you get a degree and employers would rather have that. It was good. We took a tour around campus, and I went to one of the internship spots when I was visiting the Pro-Tech program. It was nice to see what I would be learning before I came. Rather than having a classroom with a lot of students in it, there's only eight or nine people in my Pro-Tech class. You get to interact with the professors a lot more, and if you don't know something they'll come up to you and help you out. I really like that. Not really, no. I knew what I was expecting. What would you say to someone back in New Jersey about Dordt and the pro-tech program? It's definitely a good experience and lets you know about opportunities in the work world. You get the Christian education and the perspective of having a program that no other school really offers. It's different from anything you would learn from anywhere else. Is there anything else that has stuck out to you about Dordt? The community really wants you to get involved, no matter what you're doing. Whether it's activities going on in the dorms or chapel services or the clubs, which there are a lot of, or sports, they just want you get involved. Meet Hannah Adams, a secondary education and English major from Sheboygan, Wisconsin. I have a family history at Dordt. My parents met here, my older brother Micah is a senior, and my grandpa actually founded the engineering program—his name was Charles Adams. My grandma also taught here as an education professor, so there's a deep family history. I visited a couple colleges, but Dordt just seemed different. When I visited, I felt like I was connecting more with people that I met on campus. It really felt like the right place—I felt like this is where I'm supposed to be. Everyone's super friendly here, the academics are great, and the education program is just out of this world. So you went on a couple visits, or just one visit here? I've been visiting Dordt my entire life, but I went on official visits two times. I stayed overnight once and I did a visit when we were visiting my brother once. On your overnight visit, was there anything that stood out to you? I have a gluten allergy, so I made that known to Dordt, and they made sure to put me in a room with someone else who was gluten-free. She showed me where the gluten-free things were in the Commons. Dordt went out of its way to say, "We have gluten-free options here," and they have the allergen menus--it's really nice. I've got the best roommates ever. They did such a good job matching me up with my roommates. It's really funny—I knew one of my roommates beforehand. She's the niece of Dr. McCarthy, professor of history. We met in 2004 when McCarthy got married and my dad was his best man. We met again at Dordt Discovery Days, became good friends, and kept in touch. We both went completely potluck at Dordt and got each other. That turned out really well. My other roommates are just amazing—they matched us up so well, and it's incredible. My education class with Dr. Mulder, professor of education, is out of this world amazing. It's so great, it's my favorite class. It's my only class on Thursday, and I look forward to Thursday every single day of the week because it's so fun. I feel like I learn a lot. Mulder is a pretty fun guy. Speaking of professors, how do you feel that your professors have engaged you so far? A lot of my professors have mentioned how you can always come to them. I like that we have smaller classes so you get to know them a little more. Dr. Vermeer, a professor of psychology, was showing us pictures of the ultrasound of his new grandchild, which was cool because he tied that into our lifespan development class. The professors are so nice and welcoming. They go out of their way to try to talk to each student outside of class. You have a big history with Dordt--is there anything about it that surprised you? For a long time, I was kind of against coming here because of the family history, but then I went on my second visit. No one mentions my grandparents—they're getting to know me, and I really appreciate that. It feels like such a community. It's amazing. What would you tell people back home in Wisconsin about Dordt--like a prospective student looking at coming here? I have talked to a couple of my friends who are a couple grades younger than me, and I've just been telling them how amazing the programs are. If you're looking for a good Christian college that also has phenomenal programs, you really need to look at Dordt. It does a good job of tying faith into classwork, and it's not just slapped in--it's integrated into the programs. I think that's really cool. The education program is so good, and the English department is awesome. And how engaged you feel--coming here, I feel like I'm making connections on my own outside of class with what I'm reading. Is there anything else you'd like to say about Dordt? I love it. (Laughter). Oh, and the forensics program--I like to tell people about that, because that's awesome. Are you in the forensics club? Yeah, I'm on a scholarship for it. That was another thing—Dordt has a forensics scholarship, and I like telling my friends back home about that. I was the forensics team captain at my high school. Not a lot of colleges offer scholarships for forensics, but Dordt does, and that's really awesome. Meet Steven Amin, a freshman actuarial science major from Jakarta, Indonesia. My brother graduated from here this May, and I heard a lot from him. Also, Adam Adams, director for global education, came to Indonesia last October, so I heard a lot about Dordt. I decided to go to Dordt because last year, I came for a visit, and I felt that this place is more comfortable, even though it's a small town. For me, it helps me to focus more on my studies—it's less distracting. So, you visited—how was your visit? I visited last year, and it was really good. The campus was nice. The town was small compared to my hometown. In high school, every weekend I went to the mall, shopping. We have four or five malls back home, so here I felt like this was a small town. But then, after a lot of thinking, I decided to go here, because I need less distraction. First, the classes—I have small classes, so when you have a question, it’s easy to go straight to ask the professor. I like the Christian community—chapel, praise and worship—it's really good. During the ISO, International Student Orientation, I had to take the English test. I did pretty well, but I have to a public speaking class. Because of that, my Calculus 1 class was moved, so I didn't have to take it this semester. I talked to my actuarial science professor, Dr. Nathan Tintle, about that, and he said, "I think it's better if you take it this semester." He changed my schedule for me. I think that shows that our professors really care for us here at Dordt. Every professor says, any time you have questions, shoot me an email and stop by at my office—for me, that's really engaging. I didn't see anything like that at any other campus. What would you tell a student in high school from back home about Dordt? I would tell them about the Christian education, the engagement, the community, and the facilities. Campuses in Indonesia don't have a lot of facilities like here, so I would tell them we have a swimming pool, gym, track, basketball court—we have a lot. Olivia, a digital media major from Dordt College in the US vlogs a week in the life to show what it's like for a student studying in the US. 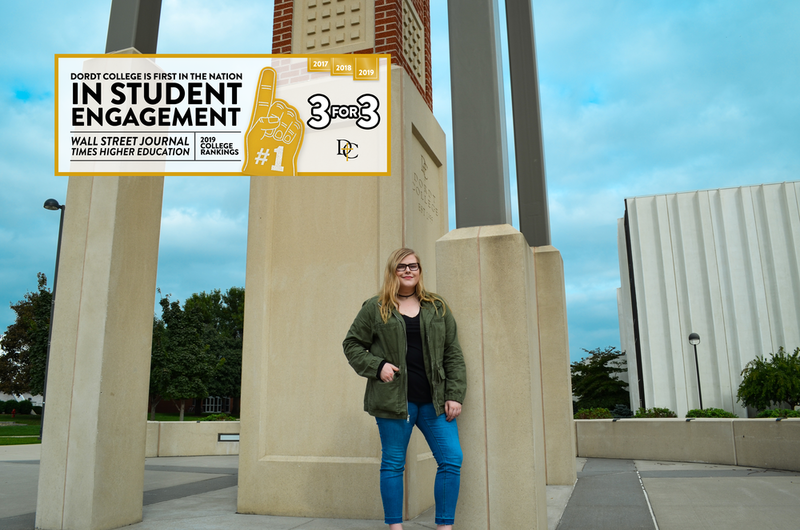 Dordt College ranked first for student engagement in the WSJ/THE US College Rankings 2019. Olivia explains why students feel like part of a community at the university. 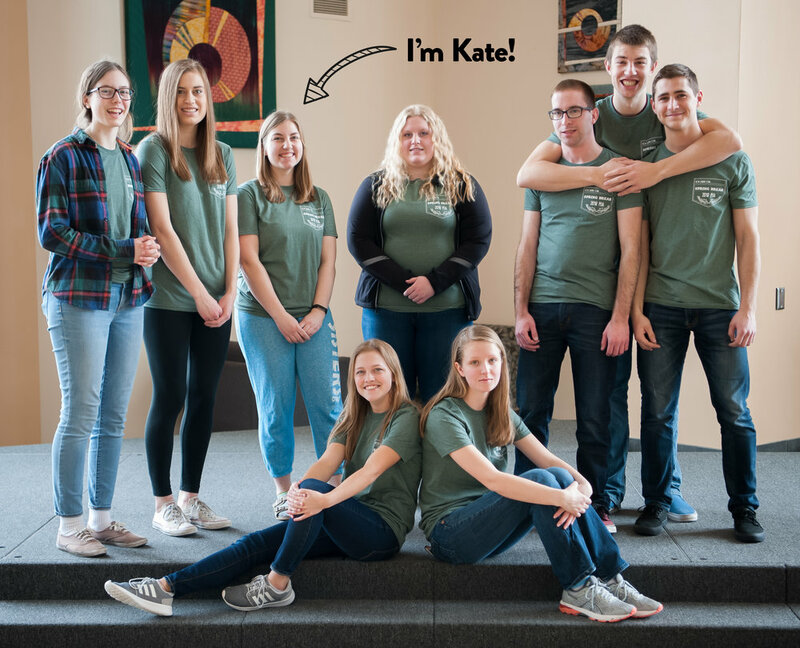 Meet Kelsey Bartels, a freshman business major and Kuyper Scholars Program (KSP) minor from Sioux Center, Iowa. Well, I'm from Sioux Center, so I've grown up knowing all about it. My family went here, but when I visited, I just felt like God was calling me to come here. Like, this is exactly the place where I needed to be. What was it about the visit that made you feel that way? I just felt very welcomed, like I was already a part of the Dordt community. I liked the tour a lot, the tour guides were really friendly. I've really enjoyed meeting a lot of new people and all the worship opportunities. My favorite is Monday Night worship—that's praise and worship and prayer. I feel God's spirit there. It feels more personal to me. I've also really liked the KSP class because it's so discussion based. It's interesting to hear what people's thoughts are. The other day, we had a really long discussion about predestination and that was really interesting. There's people from a ton of different backgrounds—like there was a girl who grew up Baptist, some people who grew up Pentecostal, and then a bunch of Reformed kids. That was cool. I feel like they've tried to teach things from a Christian perspective and really make you think about why you're doing the subject, instead of just teaching you the subject. They make an effort to get to know you, too. They encourage you to do your best and find your place in God's world. So you're a local person, and you knew about Dordt. Is there anything once you were on campus that surprised you? What would you say to a prospective student who's considering Dordt? Just pray about it and if this is the place for you, God will make it clear to you.